"Includes more than 230 species of LBJs. Over 1200 superb original paintings by the author. Innovative design to facilitate identification. 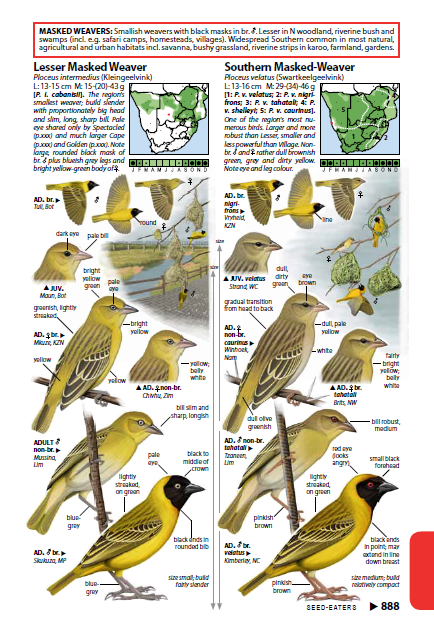 Thumbnail illustrations of the bird in its typical habitat and as it really appears in the field. Juveniles are shown in almost all species. In-flight illustrations, from above and below. Detailed, multi-colour distribution maps compiled from the latest bird atlas data (SABAP1 and SABAP2). Distribution maps show subspecies and abundance levels. Fascinating insights into LBJ biology, classification and names. Useful tips and techniques to help you find and identify LBJs." 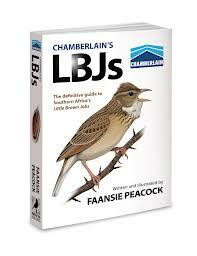 This is the most detailed book to identify southern African Little Brown Jobs. This excellent guide is full of identification tips, figures, charts, tables and keys. For pipits, warblers and bishops there are also identification guides for birds in the hand (the wing formula for bishops is based on a paper in Bokmakierie 1986, 38: 13-17) and the data is 1 sample per species - more wing formula measrements are needed). This book is highly recommended for bird watchers at any level, and even for ringers. All the southern African weavers are included, although some of the easier-to-idenity species are in the Appendix with an illustration and identification paragraph - these are Red-billed Buffalo Weaver, Thick-billed Weaver, Olive-headed Weaver, Spectacled Weaver, and Scaly-feathered Finch. See here for more previews. See here to purchase a copy.